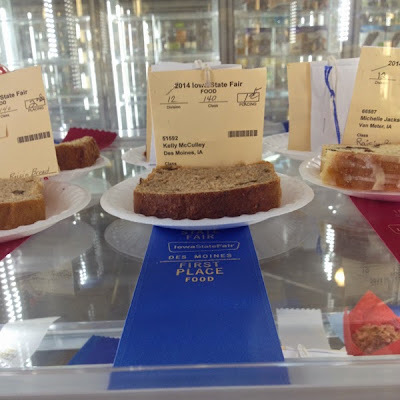 Today I'm posting my recipe as it appears on the cards I turned in for the King Arthur Flour Yeast Bread Competition at the Iowa State Fair this morning. I don't expect this bread here to win anything today. I decided around 9:00 last night that I would enter this competition, with three entries no less. My timing was a bit off, and I didn't have the right amount of time to let this bread rise all the way. I expected it to rise a little faster and the cheesy potato bread was rising super fast, but not so fast that I could have baked it first... I don't make the best baking decisions at 1:30 A.M. The decision making doesn't get much better at 7:30 A.M. after only four hours sleep. I drove myself to drop off my three entries, naively thinking I could drive into the drop off lot. Apparently one needs a special permit for this. So I ended up parking about two blocks away, thankfully for free on the street, and walked my entry in. I should have dragged one of my kids out of bed to run in for me to drop the stuff off. Well, live and learn, as they say. At least they don't require a ticket to go in to drop food entries off. Back to the point of this post. This bread is interesting because it has rolled oats in it. I'm not sure if it's the oats or the need for a longer rise, but this is a relatively dense loaf of bread. 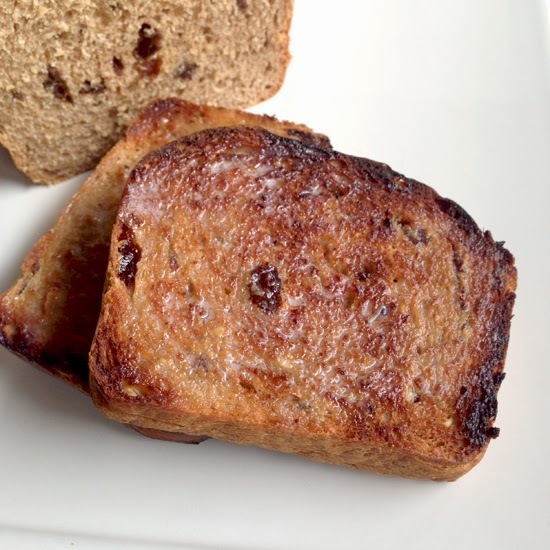 Lots of cinnamon and raisin flavor, and it tastes great toasted with lots of melty butter. There's a lot of chew to it--again, not sure if that's due to the rise or the oats. 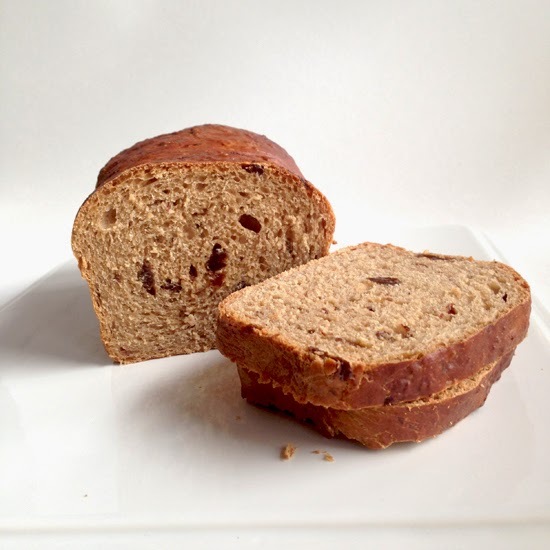 It's a hearty bread that I think my husband would like for breakfast, so I think I'll probably be making this again. it turned out the way it was supposed to. Combine and heat the milk and butter (on the stove or in the microwave) until just hot to the touch (about 120°F). Transfer to the bowl of a stand mixer fitted with the dough hook attachment and add the raisins or other fruit, water, oat flakes, 1/2 cup brown sugar, salt and cinnamon; stir well and set aside. In a medium bowl, mix three cups of flour with the instant yeast. When the milk mixture has cooled to lukewarm, add the yeast/flour mixture and turn mixer on low. Add remaining 2 1/2 to 3 cups of flour, half a cup at a time, until the dough pulls away from the sides of the bowl. Knead on medium speed for about 5 minutes. Place the dough in a lightly oiled bowl, turn to coat it on all sides, cover with plastic wrap and let rise in a cozy place until doubled in size, about 1 1/2 to 2 hours. Knock down the dough, knead briefly on a lightly floured surface and divide in half. Shape into loaves and place into two lightly greased 8 1/2 x 4 1/2-inch loaf pans. Cover with plastic wrap and let rise until doubled in size, about 1 hour. Brush tops of loaves with the egg & water mixture. Bake for 30 to 35 minutes, until nicely browned and internal temperature reaches 185 to 190 degrees Fahrenheit. Near the end of the baking time, if the loaves are getting dark too quickly, cover them with a piece of aluminum foil, shiny-side up. Turn out onto a wire rack to cool. That's amazing, Congratulations! I have just spent an hour searching, reading, and pinning a dozen or so recipes, and I have to say that I will definitely be making yours first! Especially, because it is First Place Winner! I recently moved to Italy and my local bakery surprisingly made cinnamon raisin bread that was delicious toasted with butter! So, I have been on the hunt for a recipe ever since. I was tempted to find a recipe that uses sourdough starters, because I have 4 really good active ones, but this will do! ;) Will post again, once I've baked it! Grazie e arrivaderci! Question: what do I do with the left over 1/2 cup lukewarm water and the Tbsp of brown sugar? What doI do with the 1 tablespoon of brown sugar? It's been so long since I made this, but I think you just add it with the other brown sugar. I think I was just trying to make it slightly sweeter than the original recipe. This is a great recipe! I've made made it twice and hubby loves it! I am really happy to glance at this blog posts which carries tons of valuable data, thanks for providing these kinds of data. do you have the nutrition breakdown on this recipe. I am diabetic and would like to know so I can adapt if necessary.